I was swept away by this books characters, story and charm. I loved every minute of reading it and it left me with warm butterflies fluttering about my tummy for hours afterwards. 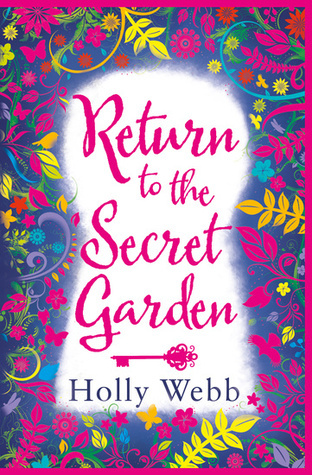 Return To The Secret Garden is about a girl called Emmie and is set in 1939. Because of the war Emmie is evacuated from her orphanage in London before the planes fly over and drop their gas on the city, along with the other children who live in the orphanage, to the countryside to Misselthwaite Hall where the owner of the orphanage lives. Upset and bitter about leaving London and her beloved cat behind Emmie find solace in a secret garden, that she finds whilst exploring, and a diary from 1910. What pursues is a touching story about friendship, family and a beautiful garden all intertwining with touching references to the Secret Garden and it’s original characters. The story of Return To The Secret Garden is told from Emmie’s point of view. She is far from happy about leaving her beloved orphanage where she has befriended a stray cat called Lucy. She is a brave, feisty character and she seems to get into trouble for the littlest things too! She is the main character and my favourite. I loved watching her grow and be happy throughout the book and the touching relationships she develops throughout. There are some references to The Secret Garden and Mary the main character from that book in the form of a diary that Emmie finds in a draw. This gives the reader a chance to read some extracts from the diary about Mary and her discovery of a secret garden and a little insight into the old classic, but in a different format. I found this perfect as for me it was a little reminder of the characters from the classic and the story that was told. A gentle nudge, but for readers who have not read The Secret Garden it is a perfect progression and flow of the story that is unfolding by each flick of the page. I also loved the homely feel of the Hall and it’s characters too. Mrs Craven is like a mother to all the children that are staying with her and I adored Lieutenant Craven when he returned home from the war. Mr Sowerby the gardener is a mysterious character and Jack, Mrs Cravens son, whilst not wanting Emmie or the children in his home, is a memorable character who mirrors Colin from The Secret Garden. The descriptions of the gardens and the Hall were just stunning I could picture them beautifully. I felt like I was exploring the garden and hall and discovering secrets along the way with Emmie. I think this made me really relate to Emmie in a way as I felt her joy, her heartbreak and the beauty she discovers through her eyes. The historical fiction side of the book actually made me tear up at times. Very much focused on how children and families were effected by the war. There is one scene right at the beginning of the book where Emmie and the orphanage children are on their way to the train station being evacuated and they walk past a school where the witness children saying goodbye and leaving their parents. It made me have a lot of feelings. Another touching scene for me again right at the beginning was when Emmie boards the train she sees another girl through the window on the train on the opposite platform going the opposite direction and as they both pull out of the station they look at each other and wave *cries*. This is a credit to Holly’s historical fiction and research in the effect the war had on children. Sign into Goodreads to see if any of your friends have read Return To The Secret Garden.